This black forest cake is a twist on a classic dinner party dessert. Scroll down for the recipe. Retro puddings have been making a bit of a come back. whether it’s Vienetta or jelly and ice cream, I’ve spotted a trend for the desserts of our childhood appearing on restaurant menus. When I think of parties in the 90s (that’s right I was a 90s child!) I automatically think of fruit and cream cakes that came out of the freezer isle at the supermarket. And my favourite of them all had to be the Black Forest Gateaux! I’m all about nostalgic food right now so I thought I’d take this classic dessert and give it an upgrade. I like to think the styling is a bit more modern and there isn’t a glacé or maraschino cherry in sight! In all honesty, I got a bit carried away slathering cream over layers of chocolate sponge and adding a tonne of cherry compote. To stay true to the Black Forest Gateaux I’ve kept the traditional kirsch spiked dark chocolate sponge layers and they are sandwiched together with a sweetened, whipped cream. The main difference is the black cherry compote that I’ve used to fill the two sponge layers and as a sticky sweet topping to finish off the cake. If you wanted to give it more of a retro vibe then you could cover the whole thing in the cream and cover with dark chocolate shavings, but I’ll leave how you decorate the cake up to you. There are a fair few processes in this recipe but I promise it is worth it. The cherries are sweet and sticky, the cream rich and smooth, the chocolate cake the right amount of bitterness to balance it all out. What more could you want in a cake?! First pre-heat the oven to gas mark 4. Sieve the flour, cocoa and sugar into a large bowl and make a well in the middle. Lightly whisk the eggs before pouring into the well along with the kirsch, milk, oil and golden syrup. Using an electric whisk beat until smooth and frothy! Pour the mixture into two well greased cake tins and cook for 25mins or until they spring back when touched. While the cakes are cooking, place the cherries, sugar and water into a saucepan and bring to a boil. Once it has reached a boil, let it simmer for 10 minutes, stirring regularly until the mixture gets thick. Add the cornstarch and zest. Stir for a further 5 minutes and set to one side to cool. By now the cakes should be ready to come out of the oven, allow the cakes to cool completely before decorating. Once the cakes and cherry compote are completely cool, whisk together the cream, marscapone, icing sugar and vanilla until thick. The cream is sufficiently whipped when it is smooth, glossy and just holds its shape. Assemble the cake by spreading half of the cream over the bottom sponge layer. Top with half of the cherries before stacking the second sponge, cream and the remaining cherry compote. Top tip: frozen cherries work well in this recipe so don't panic if they are out of season or if fresh cherries are not available in your local store. mmm, this looks so good! Have some cherries in the back of a cupboard, now have plans for them! Firstly – congrats on the new site 🙂 I can imagine it took a lot of hard work to sort all the coding out yourself! I haven’t looked back since starting to work on a self-hosted wordpress site so hopefully you will get on well with it! The Black Forest Cake looks beautiful – my partners favourite but something I have never made. I really must give it a go! This is my absolute favorite cake and I am seriously drooling over your picture. I adore Black Forest Cake and yours looks stunning. Once I used griottine cherries in kirch and they are lovely to use too. I’m old enough to just about remember when Black Forest Gateau was ubiquitous, you couldn’t go anywhere without it being on the dessert menu and yet now we rarely see it. Thanks for the reminder! This cake looks absolutely amazing! Congratulations on the blog move too! I love black forest cake and this looks amazing! Oh very well done you. I’m mighty impressed you’ve learn CSS and coded this all up yourself. It’s looking great. Despite my many years of chocolate baking, I’ve not once made a Black Forest Gateau – if I ever do get around to it, I hope it looks as good as this one. 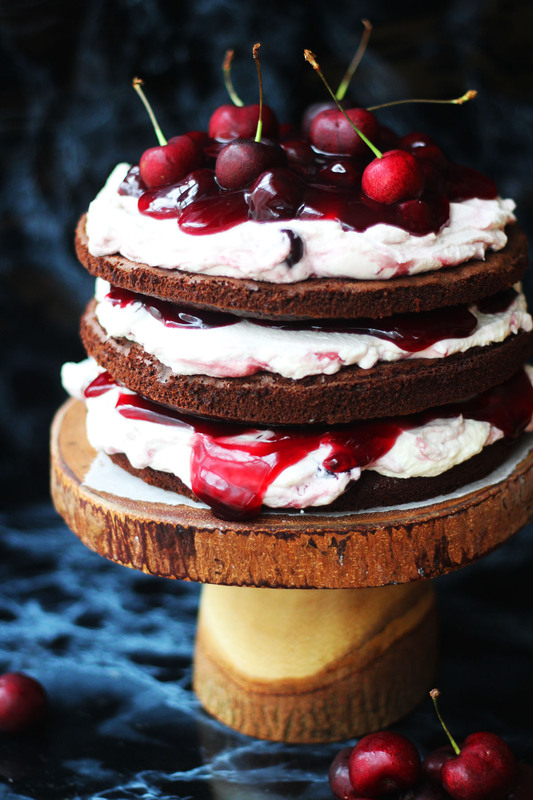 Also, this cake is layered perfection – black forest is my man’s favourite! Congratulations with your New blog! What a great way to celebrate 🙂 pitty we can’t join this looks amazing. Oh my this looks awesome! I’ll take 2 slices, please! Sounds so decadent and amazing! Would be perfect for Valentine’s Day! Thanks Jenn! You’re right it would be perfect for Valentines day! Your black forest cake looks divine! Your pictures are gorgeous! But this cake! MAN that sounds delicious!! The cake looks just perfect! Can I use all purpose instead? Hey there! If you use all purpose flour you’ll need to use about a TSP of baking powder to make sure you get a rise 🙂 add it in with the flour and make sure you get it in the oven quickly. The bubbles it creates will begin forming when the baking powder hits the wet ingredients.